Converting videos to MP4 is quite easy since there are many Video Converter to MP4 on the market, like Gihosoft Free Video Converter or other video conversion programs we’ve introduced. However, you might need to extract audio tracks from video files for playback on your music players. How to convert MP4 to MP3? This article will introduce the 5 best Video to MP3 Converter for you. Just check it out. 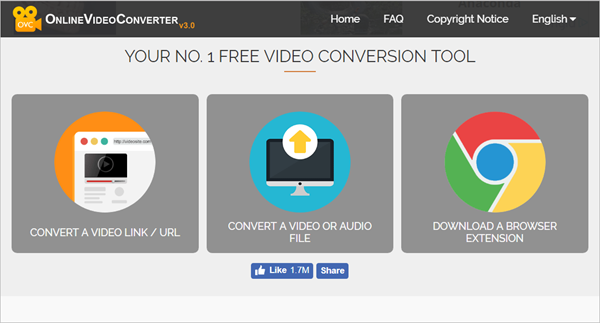 Online Video Converter is the NO.1 free online media conversion application that allows you to convert video to MP3. It can not only convert local video files to audio formats, but also act as a YouTube video to MP3 converter, with which users can directly download & save YouTube videos as audio. Aside from MP3, it supports convert video to other audio formats, like AAC, OGG, M4A & FLAC etc. The operation is very breezy, you just import your video file, choose the output format and the program starts to convert video to audio. You can download the file once the conversion has been completed. Any Audio Converter is the best MP4 to MP3 converter to convert your videos to audios. There are 14 popular audio formats to choose from in this freeware, like MP3, MP2, OGG, AAC, AC3, AIFF, M4A, APE or FLAC etc. It’s quite simple to use. First you need to import the original video file, then you can choose you desired format. You are allowed to configure the audio bitrate, audio channel, sample rate & quality as well. Finally, when you are ready, click the “Convert Now” button to extract audio from video and keep it as MP3 format. Apowersoft Free Video to MP3 is another safe, powerful & high-performance one-stop online Video to MP3 converter. It supports to convert local videos to MP3 in numerous formats including MP4, AVI, MOV, MKV and many more. Also, you can convert video to MP3 online from sites like YouTube, Facebook, Dailymotion, Vevo and other similar sites. Another advantage of this site is that users can easily search music videos from various video websites. After searching, you’ll be able to download video to MP3 directly. Free Video to MP3 Converter from DVDVideoSoft helps to extract audio from video files to MP3 and WAV lossless audio. It works with popular video formats and save audio in high, standard and economy quality. The interface of the program is clean and intuitive. Videos can be imported by using either the Add File button or “drag and drop” method. Batch conversion is also supported by this Video to Audio Converter. It can be easily used by all individuals, whether they are beginners or experts. You can also configure audio settings when it comes to the profile, channels, bitrate & sample rate. Kastor Free Audio Extractor is another contender of video to audio converter. It features a clean and straightforward layout that allows users to perform most operations with just a few clicks. This MP4 to MP3 converter also supports batch processing, which means you can add multiple items to the list and convert them simultaneously. Another amazing feature that makes this MP3 video converter tool stand out is the preview utility, you can listen to the songs with its built-in player before converting them. I’ve shown you 5 desktop and online video to audio converters for you to change video format to MP3, but there are still many similar tools available on the Internet. As always, you can leave your tips, recommendations, and opinions in the Disqus comments below.